When companies start using HubSpot’s free CRM to organize customer data and outreach, one of the first (and biggest) steps they need to take is transferring that data into HubSpot. This often means cleaning out old spreadsheets and figuring out how to recreate Excel reports in HubSpot. As with any CRM, it can take a long time to figure out when and how to take each step without consulting appropriate resources. One HubSpot CRM power user, Pete Jakob, gracefully mastered this challenge. Pete put his thoughts together in a comprehensive guide. We highly recommend checking out Pete’s complete guide above, in conjunction with our Academy article on managing the Excel-HubSpot relationship. If this is your first time using a CRM, chances are that you’ve got several Excel spreadsheets, email data, LinkedIn, and possibly even an old-fashioned Rolodex (no joke, we hear about these all the time.) Pete recommends listing or drawing out all your data sources before even opening an Excel spreadsheet. You’ll want to make sure you’re not missing any data. 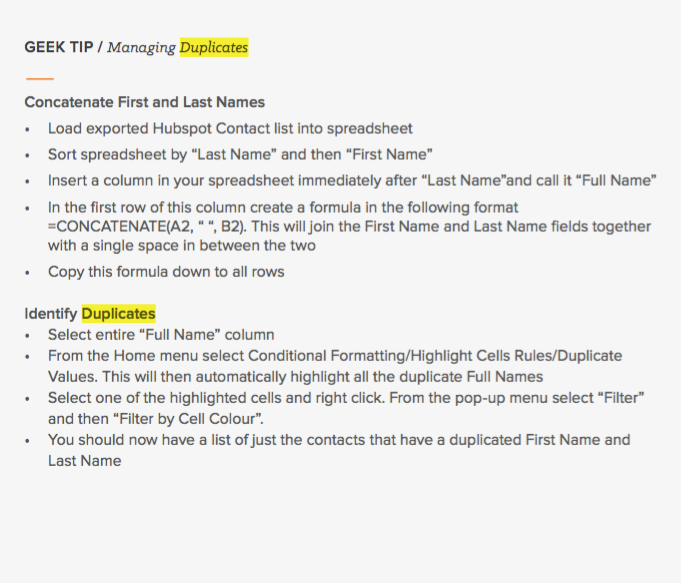 Next, transfer all non-electronic data to a new Excel sheet in preparation for importing into HubSpot. 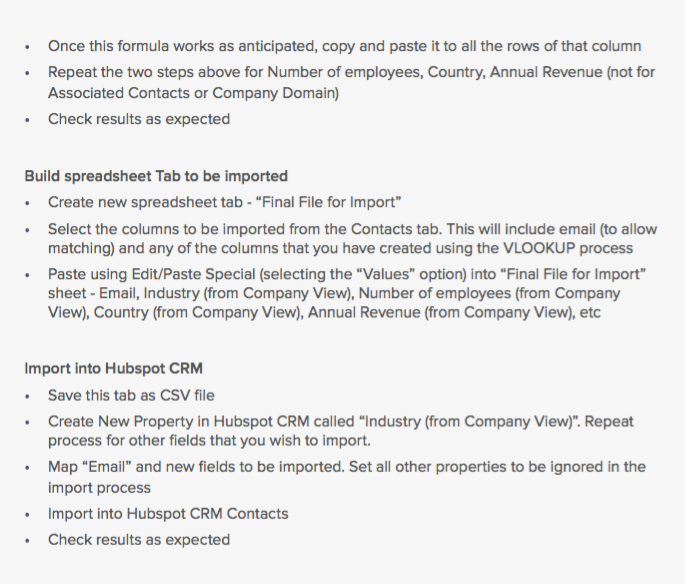 If you’re not sure how to import data into HubSpot’s CRM, keep reading. The most successful CRM users, Pete demonstrates, only import and store data that’s directly related to customers and prospects. Rather than restricting your data, this approach frees you to focus exclusively on your business when you’re in the CRM. In some ways, the messiest customer/prospect-related data is better than the cleanest personal, non-business data. Now that all of your data is in HubSpot, Pete recommends exporting all of it out again (yes, you read that right.) You might be thinking: I just went through all that effort to put the data in! Don’t forget: Although we’ve put all the data in, we haven’t cleaned it yet. Although you may have had 10 different spreadsheets that you imported into HubSpot, you can now export all that data into one or two consolidated spreadsheets (one each for Contacts and Companies) for cleaning purposes. 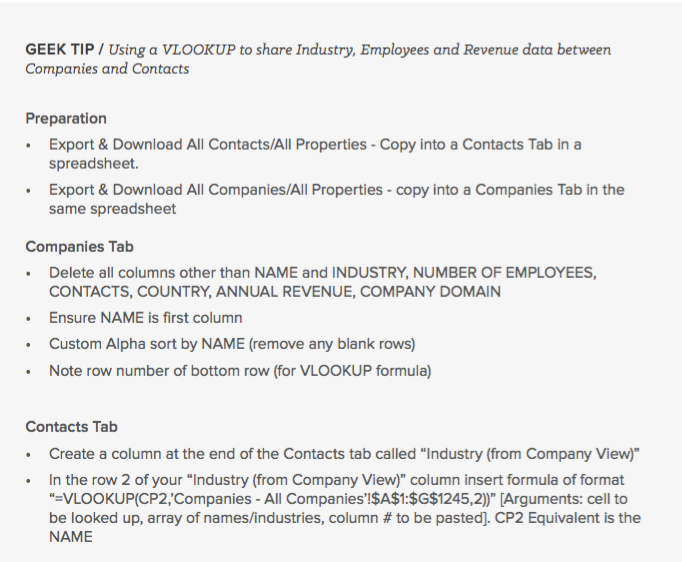 After you’re through with aligning Contact and Company data using Pete’s shortcut above, re-import it into HubSpot (refer to Quick Win #2). HubSpot deduplicates based on email address (i.e. two different email addresses will be treated as two different contacts, even if they belong to the same individual.) However, you may want to clean up duplicates to make your life easier in HubSpot down the line (for instance, to avoid sending an email twice to the same person). 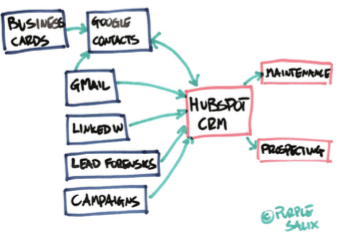 While it’s possible to deduplicate contacts within HubSpot CRM using the merge functionality, Pete’s approach above can be quicker for users who are still getting accustomed to HubSpot CRM’s abilities. One of HubSpot CRM’s powerful organizational tools, Custom Views allows you to quickly filter your database into views that can be later accessed with one click. Click on “Add Filter” on the left-hand side of your HubSpot CRM’s Contacts page. Search for the “Email” property, and click on it. Select the “does not contain” option, and list out common freeware email domains to avoid (see Pete’s illustration below). Of course, you can make many other powerful Custom Views using our CRM, such as these Views recommended in this HubSpot blog article. Now you’ve got all the tools you need to start using the HubSpot CRM and efficiently organize your business data. For questions about ongoing data maintenance, be sure to check out our Knowledge Base, as well as Pete’s guide below.